Where the mind goes so goes the energy. Your mental focus is the single most important power that you have. Focusing on your energy centers and keeping them open and spinning is something you can do on a daily basis. I usually like to do this before I go to sleep at night. When you lay down at night it is a good time to do your chakra clearing. Take in three deep breaths and imagine your body relaxing deeply down into the bed. Let all of your tension go and relax all of your muscles. Start at your crown chakra, it is deep indigo in color and is located where a babies soft spot is. As you use your mental focus imagine this chakra expanding and filling with energy. When it reaches the point that it can not hold any more, mentally imagine it beginning to spin clock wise. As you draw your breath in expand it and as you exhale spin it. I start here to open up my body to the higher realms of energy. Now that this is open take you attention upwards to your 1000 petal white lotus flower located several feet above your head. Use the same practice as you breath in open the petals and expand it and as you exhale imagine it beginning to spin. Next allow your focus to extend upwards into the heavens as far as you can imagine, draw or pull this white light down into your 1000 petal white lotus flower with your will and your mind. Imagine filling it fuller an fuller until it can not hold any more light. From here draw the energy down into the purple crown chakra filling it and imagining it spinning. Continue now down into your third eye chakra which is a higher purple color, imagine it filling and expanding and eventually spinning. Keep doing this process as you move down each chakra. Now you are entering the throat, a beautiful turquoise color, it expands as the breath comes in and it spins as you release. The whole time you are still mentally pulling this light down from above into and through each of your centers. Next is the heart, apple green in color, you expand it across your whole chest and spin it on the exhale. Continue to your solar plexus located in the center of your stomach, a yellow color, fill and spin. Going further now to your sacral chakra which is orange, allow it to fill with the light and spin on the exhale. As you reach the root located at the base, it is a bright red color as you fill this center when you inhale imagine as you exhale that you are now expelling all negativity and anything that was held in your above chakras, out and down into the earth from where it came. Feel it pour out of your body from the balls of your feet, where there are two brown chakras located there. Imagine these feet are like roots of a tree. They go down deep into the earth and grab on. Once you have released everything that is held in your chakras to the earth you can now draw the power of earth back up through the feet and bring it through every one of your centers on the way back up. Imagine the power coming upwards and spinning each center as it passes. When you reach the crown imagine a white beam of light extending back out to the universe as far as you can see. Take a moment here and imagine that you are a pillar of light, connected both to the heavens and the earth. See your bodies energy centers humming and buzzing and perfectly balanced. This is the practice. Doing this meditation is powerful. It can cause your kundalini to rise when done regularly. I would advise you to read about that and educate yourself so you know what is happening if it does rise. 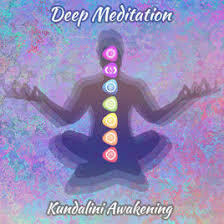 There is an article on my website called Kundalini Rising, go to Your pain is my pain and read about it.